Eagle’s syndrome, also known as stylohyoid syndrome, is a painful syndrome of the faced caused by an elongated bone called the styloid process. The styloid process is located near and below the ear. In the same area as the styloid are the carotid arteries, internal jugular vein, facial nerve, glossopharyngeal nerve, vagal nerve, and hypoglossal nerve. An elongated styloid process occurs in about 4% of the general population, while only a small percentage (between 4-10.3%) of these patients are symptomatic. The true incidence is about 0.16%, with a female-to-male predominance of 3:1. This problem has been known as Eagle syndrome (ES) since 1937, when an otolaryngologist at Duke University, Watt W. Eagle, described the first cases. The pain occurs with movement of the jaw or turning of the neck and is sharp and stabbing in nature. The pain can radiate to the tonsillar area, ear, or base of the tongue. The neurological exam is normal but there may be trigger points in and around the tonsillar area. The patient may have ringing in the ear or difficulty swallowing. 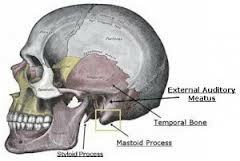 The styloid process may compress neurological or vascular structures in the area and cause additional symptoms. X-rays, MRIs and CTs of the area may be used to identify the elongated styloid process as well as to look for other casues of pain such as glossopharyngeal neuralgia. Treatment of Eagle’ Syndrome starts with injection into the area of a local anesthetic and a steroid. Medications such as Gabapentin and Pregabalin may be useful to decrease the pain. In cases that fail conservative modalities, surgical removal of the styloid process may be indicated.